Camping lets you spend the night in remote places and take a break from these luxurious comforts of home. And, as great as it feels to be outdoors, it's much harder to enjoy yourself without a good night's sleep. 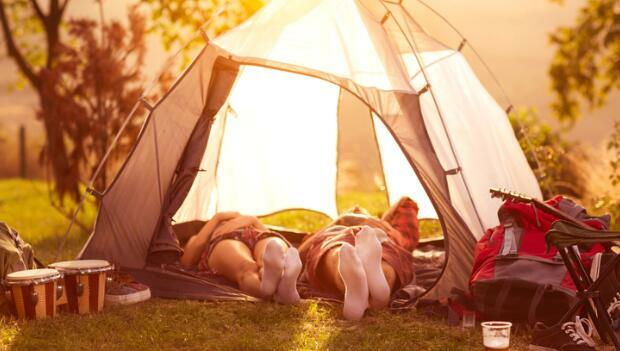 Next time you're sleeping in a tent, take these tips with you. There are a number of bedding options available for tent camping. Whatever product you choose make sure it packs small and inflates comfortably. This keeps you off the hard ground and gives you freedom to adjust the firmness. If you're car camping, it's always nice to bring an extra egg crate mattress pad to throw over your camping pad for extra comfort. If you can fit a small backpacking pillow in with all your gear, do it. Pillows can make all the difference when it comes to staying snug in your tent. You can also stuff extra clothes inside a T-shirt for a makeshift pillow, but it may require frequent fluffing. Some campers love to let the sounds of nature lull them to sleep, while others can't stand the chirping and screeching of bugs throughout the night. The solution: block the noise or drown it out with something more pleasant. Ear plugs are a must for light sleepers. They're extremely small, cheap and disposable. Pack them whenever you plan on sleeping somewhere new. Besides sleeping in a tent next to the ocean, there are other ways to create white noise. Some devices, including smart phone apps, play sounds that make you feel like you're sleeping next to a peacefully trickling stream. Even in the summer, night time can get cold in the wilderness, especially at higher elevations. Scout out your destination's weather report ahead of time and make sure your sleeping bag is made for the right temperature. If you're unsure, sleeping bag liners can add up to 25 degrees of warmth.